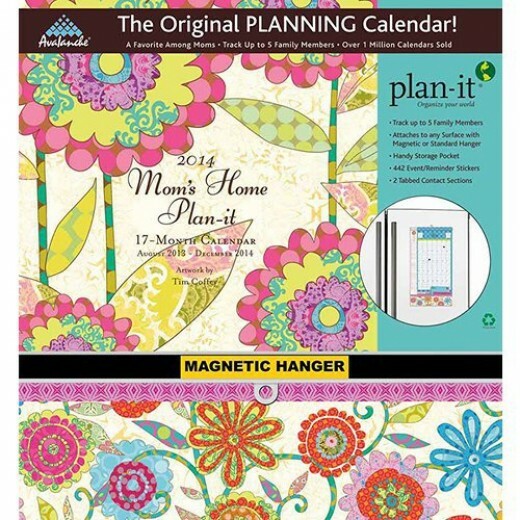 Planners, Desk and Wall Calendars and even calendar reminder stickers. 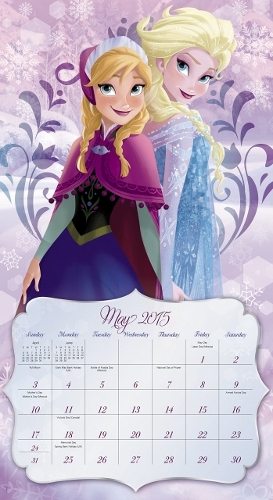 Calendars and planners are a necessity of life - well, if you have any intention of keeping organized that is. I've made it my business to find you the best engagement planners and inspiring calendars around. These are unique. My themes include nature, religion and spirituality, girly stuff and more. Because I like to keep organized, I've tried finding out whether the planners are dated or not. I don't really get why there are so many undated date books out there (why call them date books if they don't have dates?) If someone can explain this conundrum, I'm all ears. In the meantime: I'll give you all the information I have on what the planners contain. A unique planner has one other advantage of course: it will really feel like YOUR calendar book. And why have a boring calendar on your kitchen wall? The top planners, datebooks, organizers and agendas! This list shows the most popular planners and datebooks that my readers are purchasing this year as a way to keep their busy schedules organized. 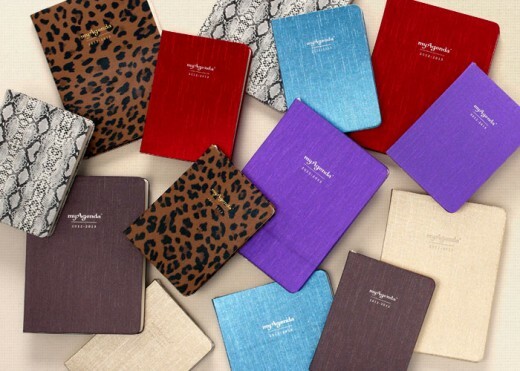 This quality line of datebooks by MomAgenda includes planners for non-parents as well. And they're just so cute! MomAgenda has made a name for themselves making calendar books to help you organize your family life. They have space for the schedule of up to 6 people: that is mom, dad and four kids for instance. More than that - their line is positively pretty. Fortunately for your stay-at-home dad: the chocolate version is not TOO feminine I think. I love the bright colored planners. I think even a Dad could appreciate the orange and purple. You NEED your planner to jump out at you from amongst all those papers that flood a family home. Men, women and teens can benefit from having a good planner to help them keep track of the busy lives that they lead. No matter if they have classes to keep track of, business appointments to remember or all of the kids schedules in the family. A gift of a planner can be helpful and is usually much appreciated by the person who receives it. For the busy mom or dad who not only has to keep her own schedule in order but usually has kids and Dad to keep track of, also. I love these Planners because they are magnetic calendar planners and you can put them on something like the Refrigerator, in full view where everyone can see it.There's space to keep track of five family members on the extra large grid on most of these great time management tools. One style becomes a 2 in 1 calendar, you can use the monthly grid to mark main events and the weekly pad when you need to plan your week. Making Mom's job so much easier to keep everyone's schedule in an order that she can follow and others in the family, too. The famous Big Grid Calendar from Amy Knapp is made for every busy mom and her family to help them stay on top of multiple and hectic schedules. The grid format is the key. Color coded stickers show you who is doing what at a glance. The calendar also helps you track bill-paying, grocery shopping, family chores, and all the details of normal family life. Never forget another birthday, anniversary, or other important event. The Big Grid also has tools for planning ahead for vacations, back-to-school, and holidays. 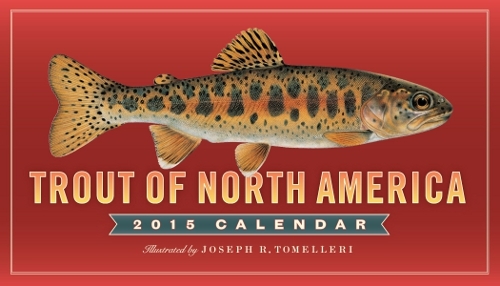 Each year the calendar goes from August to December the year after: 17 months. If one of your most favorite things is to be "awhhed" by photographs of sweet little babies that have been photographed you will love the suggestions included in the articles listed below that feature cute babies in a calendar or planner. 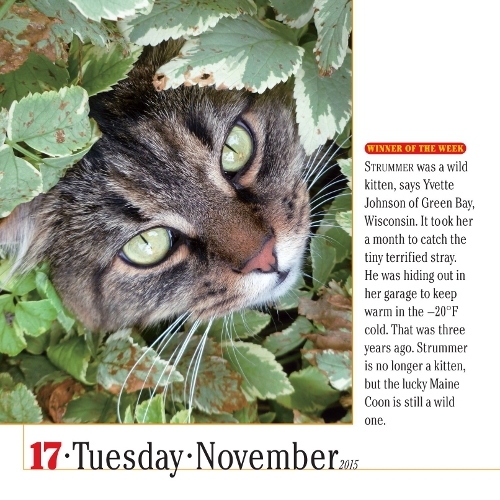 Great articles that will suggest calendars and planners that deal with nature. Some have sweet little babies of the wild while others may get more specific on places or spiritual aspects of nature. Some are photographic delights while others offer an artists interpretation of things of nature. 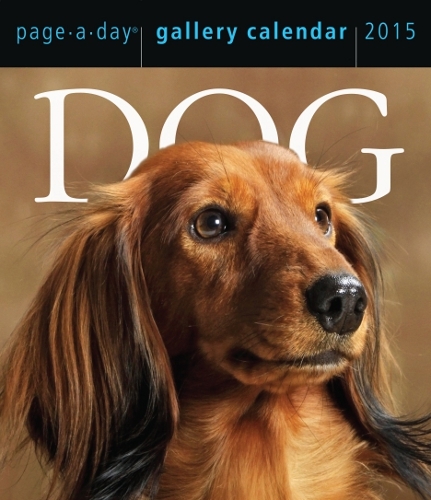 For those of us who share our lives with pets or are just someone who loves animals in general, our choice for a calendar or a planner will often be a Pet and Animal Calendar and there are so many choices when we want this option. Adorable kittens and puppies or full grown pets in specific breeds are choices that we have whether we are considering the calendar for ourselves or for a gift. But we are not limited with just those types of pets. We can also choose from birds, horses and other animals that we share our lives with or just admire from afar. There are even options for animals of the wild for our time management choices. Some of my very favorites are the ones that show baby animals both domesticated and wild. There is just something about a baby animal that starts the day out on the right foot. Cats and dogs, canaries and fish, rats and other small rodents: those are some of the pets people keep at their home. 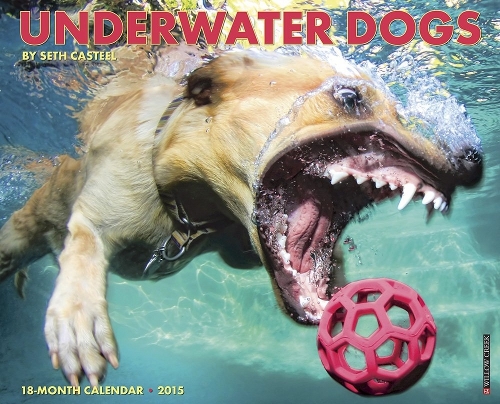 I've found you calendars featuring your favorite pets. Pets are animals kept in a home, for the enjoyment of the owners. There is no economical benefit in them at all - for the owner that is. There is of course a huge industry aimed at providing for pets: they're much loved and pet owners spend a LOT to keep them happy. The dog is a domesticated form of the gray wolf. The term is used for both wild and pet varieties. The domestic dog has been one of the most widely kept working and companion animals in human history - and it's probably because of that, that dogs understand their human owners so well. Dogs did not originate as pure pets - they helped humans hunt, in transportation (sled dogs) and guarded them. Many dogs are still used for practical purposes, like helping disabled people. The cat is currently the most popular pet worldwide. It has been with humans for at least 9,500 years. Unlike dogs, cats are known for their unpredictable nature. They almost seem to have two personalities: the hunting personality, in which humans are ignored, and the home personality, in which humans are a great source of cuddles, food, and sitting places (aka laps). 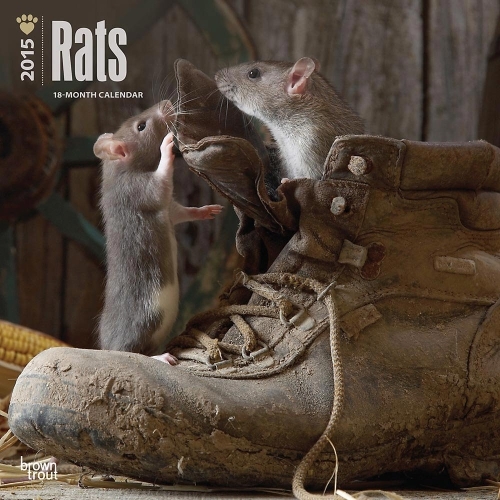 Though associated with suers and things, rats are also a popular pet. Because they're so small, they can be kept in almost any home. They're smart, furry and sociable as such. The first none-mammal pet on this page, fish are kept in an aquarium, mostly for their beauty. Steven N Meyers is a photographer and radiology technologist, who uses x-ray photography to reveal the inner details of flowers and plants that are not normally visible to the human eye. To obtain these amazing effects, Steven uses large format film that is supersensitive. 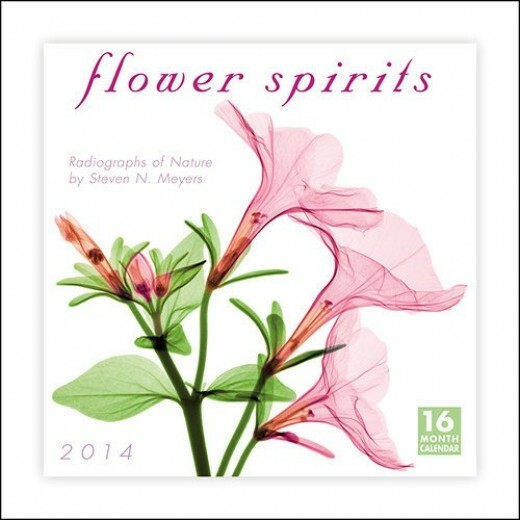 For Flower Spirits, Meyers radiographs have been digitally altered to create these beautiful, luminous images. Flower Spirits are available in standard wall calendars, mini-wall, pocket planners and softcover engagement editions each year. They are really a lovely calendar no matter which format you choose for yourself or as one to give as a gift to someone. Perfect for the "birders" or bird watchers of the world. Some will feature the birds that bring us sweet songs while they are around while others might be specie specific like the incredible owls or hummingbirds. Each religion and spiritual tradition has its own celebrations. These holy days or seasonal days are often linked to the movement of the moon and the sun instead of a specific date on the calendar. Going by the calendar year, all are dated and offer spiritual inspiration through quotes and photographs to keep you inspired throughout the year. Very popular each year are the Bible Scripture Verses Calendars. What young girl doesn't want to be a Disney princess? From Snow White to Cinderella, the classic fairy tale princesses to the more modern ones: Aurora, Ariel, Belle, Jasmine, Pocahontas, Mulan, Rapunzel and Tiana. One of the recent Disney princess movies to come out was Rapunzel (you know, the princess trapped in the tower, with the long hair). Frozen was by far the most popular one recently. They're working on part 2. Claude Monet's seascapes reflect a relationship with the sea that began when he moved with his family to Le Havre, on the Normandy coast. 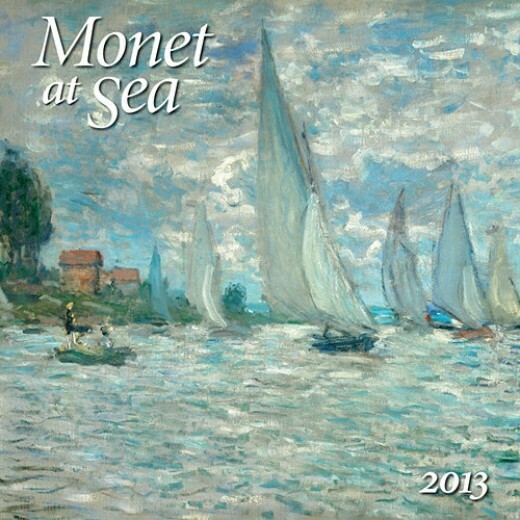 The paintings included in this calendar reveal Monet's fascination with the effects of light on the waters he came to know well. I was looking for more information on salon appointment book keeping. I just got a new job and it requires me to schedule and keep track of appointments. I appreciate the tips and information you provided in this article. Thanks for your help! Whether you like a good cartoon to make you chuckle, a religious or spiritual message or you want some trivia to keep your mind sharp; one of these articles featuring desk calendars will appeal to you. Desk calendars are usually small and are a page a day format where you tear each days page off when the day is done. Sometimes it might be in book form but not typically. As you click through you'll notice that some of the gift pages are on this site, some are on other sites I've set up. See also my new gifts blog.